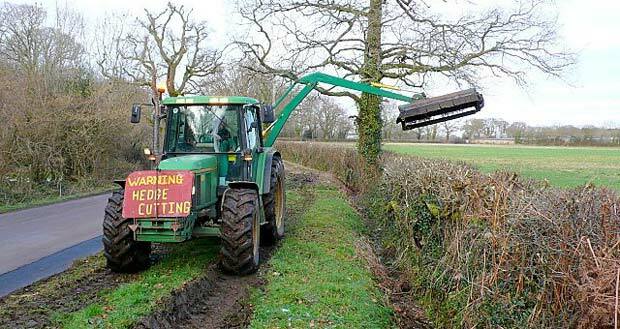 The Irish Wildlife Trust (IWT) have once again called on members of the public to report illegal hedgerow cutting to both the Gardaí and the National Parks and Wildlife Service (NPWS). Unless for reasons of health and safety, hedge cutting is in breach of the Wildlife Act 1976 which bans hedge cutting from March 1st to August 31st each year. According to the IWT, landowners, communities and even local authorities continuing hedgerow cutting throughout the year despite the ban. “In comparison to other countries, Ireland is farmed very intensively,” Conn Flynn, IWT Development Officer said. “As a result, it is a country of fields with very little forestry and tree cover. Hedgerows are therefore essential for maintaining wildlife diversity, supporting species such as badgers, owls, hedgehogs, stoats, blackbirds and innumerable plants, butterflies and other insects. “Not only are they an invaluable resource for much of our wildlife, they are vital in providing pollinators, cleaning our air, defining our landscape, storing carbon and by holding back the flow of water off land they can alleviate flooding. “The IWT wants to highlight the value of hedgerows and we want people to report these incidents. While genuine health and safety issues should never go unaddressed, we believe that this clause is being used in a blanket manner to excuse hedge-cutting anywhere and at any time,” says Flynn. The IWT is urging people to report cases of illegal hedgerow cutting and where possible provide photographic or video evidence.